The following charts are created with production data from Statistics Canada (CANSIM 131-0001) and other reports from government ministries. 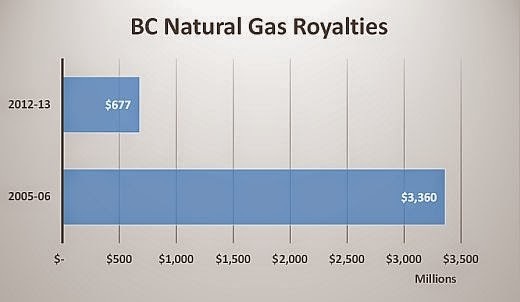 These demonstrate significant changes of income from exploration and production of British Columbia's oil and gas. I will add commentary in subsequent posts but I invite readers to examine these graphs. "...In many cases, lawyers and auditors who specialize in production accounting tell ProPublica energy companies are using complex accounting and business arrangements to skim profits off the sale of resources and increase the expenses charged to landowners. "…Once the gas is produced, a host of opaque transactions influence how sales are accounted for and proceeds are allocated to everyone entitled to a slice. The chain of custody and division of shares is so complex that even the country’s best forensic accountants struggle to make sense of energy companies’ books.
" 'They just wait to see who challenges them, they keep what they keep, they give up what they lose,' said Root, the NARO chapter president. 'It may just be part of their business decision to do it this way.' "
It couldn't happen here because gas producers in British Columbia are keen to pay fair value to the owner of natural resources, which happens to be all citizens of the province. No company would cheat just to add profits to the bottom line. Although, if they did do that in BC, they'd likely be home free because, as part of its red tape reduction program, the Liberal government has pretty much given up its ability to do anything more than cursory examinations of production records and it certainly is not willing to have "the country’s best forensic accountants struggle to make sense of energy companies’ books." 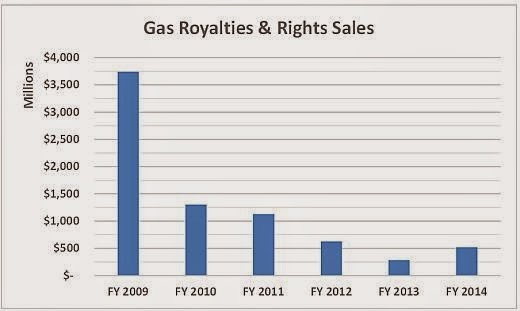 Other than the Winter Olympics and Christy Clark… what happened since 2005-06 to make such a crash in natural gas royalties — from increased output? Do you have a chart on royalty credits cashed in? Do these figures align with the tenure of Gwyn Morgan as the preemy's advisor on such matters? Thanks, Norm for the very telling stats on this issue. Can you imagine how well of our schools and hospitals would be if we were getting our fair share of those royalties? Instead, those royalties are staying in the corporate accounts to pay crazy bonuses, shareholder dividends and political graft. Of course none of those beneficiaries have to worry about medical and education costs for THEIR families. The discouraging part in all this is that the average Joe who complains about wait lists and lack of books in schools, only when it directly affects them, pays little attention otherwise. A single mom, who struggled to advance her own education by becoming a teacher, has been unable to find work for 2 years. She pays “no attention to that stuff” regarding teacher bargaining, layoffs and children’s suffering. Another individual who, in an honest effort to survive, worked two jobs until recently when the Aquilini Group “fired” her from her job at Rogers Arena. She and the others were replaced with cheaper labour. “I don’t know what I am going to do if I can’t replace that second job but I can’t do anything about what they did either” was her response to my questions. Is it any wonder the looting and plundering continues and grows every day? We have taught them they can do it. Thanks also, Norm for the heads up on Ian Jessop”s piece with John Horgan. That was a great 10 minutes and if the rest of the province could hear it, Horgan would go a long way towards establishing his credibility and making more people comfortable with the NDP. Nice to hear him refer to you several times as well. Just too bad it was on some little station on an Island far away from the votes that really count. Did we and media somehow miss a pre-election discussion about cutting resource taxes to a fraction of what they had been? Wouldn't that have been appropriate? Did these decisions get made in the Legislature or a bag man's offices? Looks like privatizing profit and publicizing debt of provinces riches ? Wake up BC 60 billion debt and counting. Putting the prices on the graph would help rebut a simple "but prices have a declined" argument. 2013 Prices are about 1/3 of 2006 prices. Royalties are about 1/6. Drop-off in exploration revenues are a predictable consequence of price drops though. Hard to imagine the days of $1B exploration auctions returning any time soon, in such a down market. I added a graph that shows a 12 year history reflecting natural gas royalites as reported in public account and gas production volumes reported by StatCan. It is obvious that returns to the public dropped dramatically and there was a significant alteration after the 2009 election. I don't recall levels of natural resource taxation being a major issue discussed in that campaign. But then, HST was in the works but not honestly revealed during that election. Thanks for that input, Paul. I recall about 6-7 years ago, sales reps coming around the neighbourhood, pressing people to sign up for natural gas price guarantees. I recall the market was deregulated at that time. I declined and watched NG prices fall quite nicely in the following years. I assume that our falling NG prices corresponded with the rise of fracking in the American midwest… we've had to drop our prices to still be able to sell to WA State. Paul, you say that prices are currently about 1/3 of the 2006 rate — and royalties are 1/6. Why aren't royalties also 1/3? I have some guesses but perhaps you can lead us straight to the reasons. Thanks. Barry, I would guess, and to some extent Norm has previously documented, that since the collapse in NG prices, the producers have been pleading poverty and threatening to take their exploration and production activity to lower cost/regulation jurisdictions, in particular Alberta. The nice thing about Alberta relative to the Peace country is that it's just on the other side of an arbitrary border over the prairies, so moving the rigs is a relatively easy thing. Even the workforce can commute, to an extent. So since the price crash, the producers been the beneficiary of various "temporary" changes in the royalty regime, to induce them to stay. Paul, I've been told that gas companies successfully pleaded for relief on royalties after they grew uncomfortable with amounts paid for exploration rights in 2008 and 2009. As a result, a compliant government gave them subsidies for "deep drilling" and for roads to offset costs of reaching difficult terrain. Government said we had to pay these subsidies to encourage gas companies to continue the search for difficult to find and scarce natural gas. 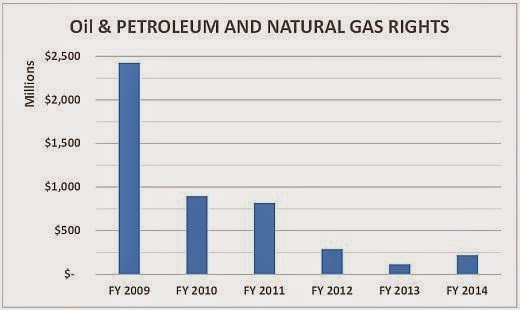 A while later, with those particular subsidies entrenched, government says we have such an extraordinary surplus of natural gas that we must subsidize gas companies to liquify and export surpluses. How would you like to lead a high school logics class with that scenario? Apparatus: sleeves, small card table, three shells a and pea. 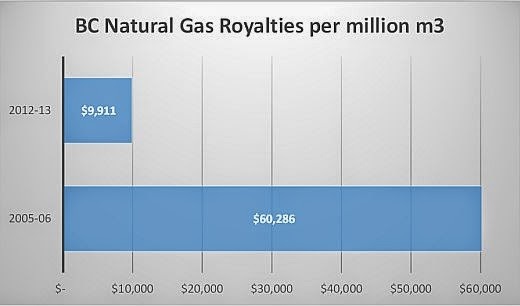 There are less obvious costs arising from natural gas deveopment so the industry's failure to pay taxes costs us all more than we realize. These are apart from costs arising from inadequate schools and social infrastructure in areas suddenly overwhelmed with new and temporary populations. "when you industrialize a rural or suburban area, you get lots of trucks. This usually means more traffic, more wear and tear on roads and bridges, and increased accidents. Fracking a single well (which can be fracked multiple times) can involve thousands of tons of sand, thousands of gallons of chemicals, and millions of gallons of water — all which arrive by truck. 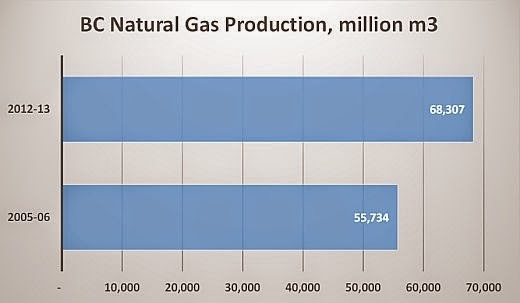 And that doesn’t include the trucks needed for equipment, drilling and the oil/gas itself, not to mention the workers coming and going, the building of pipelines, compressor stations, mining for frack sand, and other related infrastructure. Multiple these by hundreds or thousands of wells across a region and you end up with some big problems, especially when this involves windy, country or mountainous roads. "